Local content in regional Australia—2017 report examines the availability and consumption of local content and local news in regional Australia. 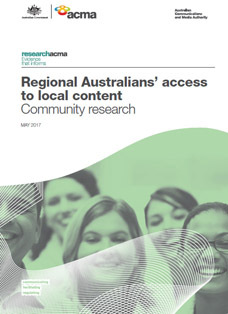 Regional Australians’ access to local content—Community research: a survey of regional Australians’ awareness of, use of and preferences for accessing local content and local news. Regional Australian television news—Audiences across regional evening news services, 2003–16: an analysis of free-to-air television audience and ratings data in regional Australia from 2003 to 30 June 2016. Availability of local content in regional Australia—Case studies: updated case studies of how local content and local news is provided in 11 regional markets. The 2017 report builds on research into regional local content undertaken by the ACMA in 2013 and published in the Regional commercial television local investigation. It also presents new findings on the availability of, and preferences for, local news, with a particular focus on the provision and consumption of local news on commercial free-to-air TV. Findings from the 2017 report and related reports will help the ACMA to undertake its statutory responsibilities for local content. 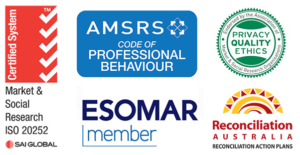 The ACMA expects that the research will also assist ongoing discussion and research about the provision of local content in Australia. To view full report, click here.